Whether you’re just starting a new business or you’ve been in business for years, you will always be able to manage your time more efficiently when you have an organized office. Paper Tiger Filing System Software is a system for office organization, which is being used in companies of all sizes, ages and types. Employees won’t be wasting time searching for paper files when they could be doing things that are much more productive, thus saving companies money while increasing productivity. No matter how electronic (translated as “paperless”) we claim to be, we find that 80% of companies are still struggling with stacks of papers. So if you are still trying to organize your paper files with the traditional alphabetical filing system, and you are still having trouble finding documents when you need them, consider implementing (and using) Paper Tiger. Paper Tiger allows you to maintain your paper files that you need to keep in hard copy format. You can keep your paper in its original form (you do not have to scan it), but simply index your paper files into Paper Tiger’s database and use the power of the computer to quickly and easily find the information when you need it. You can index anything in Paper Tiger; it’s not just document management! Some things just can’t be scanned, i.e., passports, contracts, binders, books, flash-drives, CDs, DVDs, etc. That cannot be done with systems that require scanning into an electronic file. The beauty of Paper Tiger is that keywords allow anyone in the office to find the document that might have been named many ways by many employees. 1. You can find anything you need, whether it is six months from now or five years from now, and you can find it within seconds! 2. You can quickly tell someone else how to find the required material. Paper Tiger is simply a software program that allows you to catalog your paper documents, and the computer then uses its search capabilities, to pull up your keyword and point you to the correct folder in your desk or file cabinet. - What do I name this so that I can remember how to find it? Call it multiple names, listing all keywords you might possibly think of when trying to locate the document again. Add keywords when necessary. - I don’t have the right colored folder. Purchasing different colored folders as a way to categorize files in the hopes of narrowing down our search later is completely unnecessary when using Paper Tiger. - I don’t have time to create a tab for a new file. Your file folders are numbered and are made up in advance. Filing a new item simply becomes a matter of dropping it into the next open folder. No matter how large or small a company, time management is a must. When people are wasting time searching for items, they aren’t being productive. Searching for files is a huge waste of time, especially when there is Paper Tiger to make the job faster and easier. The less time one has to spend searching for files, the more time can be spent doing things that are actually fruitful. The better you and your employees are at managing time, the more efficient your company. When documents are filed using Paper Tiger, various keywords are input, and anyone who has permission to access the database can conduct a quick search of keywords, and the needed document can quickly be retrieved. The keyword search can also work for returning the document to the correct file. Of all of the office supplies you pay for, this software is one of the most important. In addition, Paper Tiger will virtually return the investment when the time wasted is put towards working! Allow Paper Tiger Filing System Software for office organization to help reduce wasted time, make filing less of a chore, and keep you and your employees working more efficiently. Yes, it’s time for back to school already. Teachers are making preparations and gathering everything they need to get started. And parents are already shopping for school clothes and school supplies. There are lots of things to do and think about when preparing for back to school. Preparation and making sure you have everything needed can cause some anxiety, and then to think about keeping it all organized is another issue altogether. You will want to have a place for everything and an organized system for keeping track of those things. Organization is helpful in any situation, and getting organized is even more important when adding school schedule and activities to help keep sanity and manage the stress level to a minimum. If you can instill a system of organization in your children and follow the same plan yourself, then you won’t feel completely overwhelmed. Creating a place for all school items will help teach children to get in the habit of getting and staying organized, and they will see how much easier life can be when they are organized and plan ahead. Following are some great recommendations from Sherry Borsheim of Simply Productive and a Paper Tiger Expert for organizing kids. See if some of these will help you. There’s sports schedules and phone lists, papers to sign, health records, music books, report cards, and precious keepsakes that tend to pile up around the house. Then there’s the sports equipment, jackets, shoes, backpacks, lunch containers, homework, projects, and electronics that your children drop at the door when they come home from school or other activity each day. Times this by three to five kids and you’ve got a giant heap sitting on the floor on a daily bases. The key to keeping your sanity and peace of mind is to create a place for them to easily hang their coat and backpacks. I love the storage locker system if you can create space for this in your home. Create a homework area and have all the necessary supplies handy for their projects as well. Then gather all the sports equipment and store each child’s items in separate bins, for each sport, including sports clothes after they are cleaned. Store bulky equipment that won’t fit in a bin in a one area. If they play soccer and baseball, then have a small clear container for each sport and make sure to label the bins “Soccer Clothes” and “Baseball Clothes.” When you’re rushing out the door to soccer, the right socks and shorts will be in one place verses all over the bedroom or house. You’ll know exactly where these items go because they have their ‘own place’. Now to deal with all the other papers. 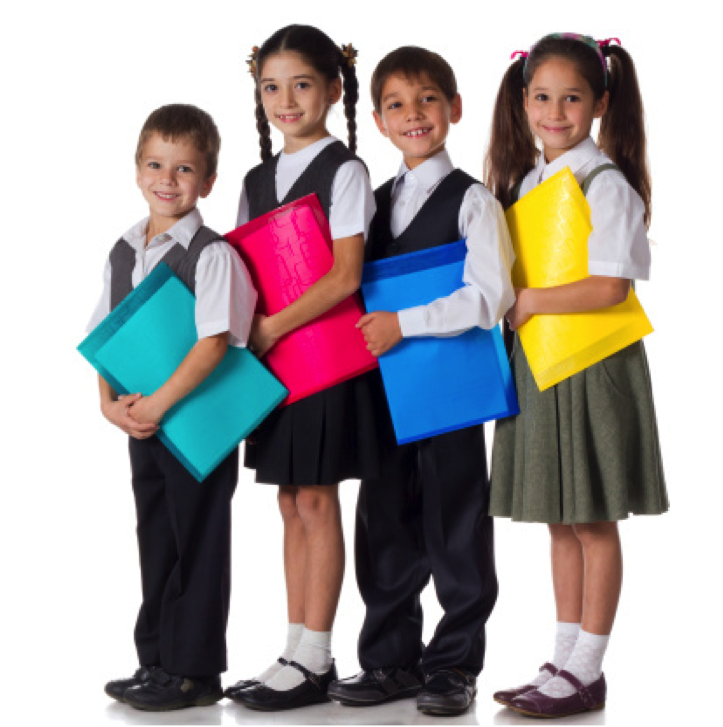 In a filing cabinet, create a hanging file for each child and keep any awards, report cards and other keepsakes in this file for the current school year. At the end of the school year, simply take out the papers and file into their keepsake box. For larger artwork, just take a picture and store the photo in their school photo album. Or store large artwork in an art portfolio. Be realistic about what school papers and artwork you are going to keep. The more stuff you have, the more time and space it will take to store it. A good rule of thumb is to “keep the best of the best and let the rest go”. Ask yourself, when was the last time you looked at your keepsake box stored in your attic? After you’ve decided what paper files need to be kept, then index the keepers into your Paper Tiger Filing System database. When you need to retrieve an old project paper, you can search the database and you’ll know exactly which hanging file it was placed in. Also, each child could have one file for archives that should be kept and one file for stuff that can be tossed out when it’s no longer needed, to avoid having to sort through the files on a regular basis. For any of the files or artwork that you’d like to box up for storage after the school year has ended, simply transfer the items in your Paper Tiger database to track where you’ve moved them. For example, you will most likely want to keep Health records and Report cards for all school years together, but move the other items specific to a school year out of your file drawer. Maybe you have a file box or bin in the attic or basement where you keep “the best of the best” in storage, so you’ll create a ‘location’ in Paper Tiger for Susie’s Archives. Print out labels for the hanging file folders in Susie’s Archives. In your Paper Tiger database, you’ll select the items you want to move, such as Awards and Archives, then conduct a Transfer, Duplicate or Move function for these files to be transferred to Susie’s Archives. Then you’ll physically move the files for the school year just ended from your file drawer to the correlating file folders in the designated file box or bin in storage, leaving the hanging file folders in the original location in your file drawer. Note, if you duplicate these items in the database, the original item names will remain in tact for the next school year, and you can edit or delete any keywords for the next school year for those items. Or, if you conduct the move function for the items in the database, then you can simply add new items as necessary for the next school year. Or, if there is only a few files that you want to combine into one hanging file folder in the archives location, you can 1) create an item for the school year 2014-2015 in Susie’s Archives location, then select the items to be moved, then Transfer, Merge those items into the new item for the respective school year. In this case, you’ll physically move the files from their separate original hanging file folders and place them in the one hanging file folder for 2014-2015. For English, Math, History, and To Be Tossed, these can most likely be tossed out at the end of the school year. Simply delete or edit the keywords for each of these items as necessary. Setting up Paper Tiger Filing System now will help you to eliminate clutter and get organized. If you decide early where everything should be kept, what you will do with the ‘keepers’ at the end of each school year, and maintaining the system of organization, each school year will be less stressful. Of course, Paper Tiger is not just for your child’s school files, and it’s not just for filing papers. Anything that you can put a number onto can be indexed in Paper Tiger Filing System so that when you need something, you can conduct a search for the keyword relating to the item and find it quickly, as well as where to return the item when you need to put it away. You can live organized with peace of mind because you have a place for everything, and have implemented an organizing system that helps you find what you need, when you need it! Click here to find more helpful tips for organization is key when going back to school. Organizing Books – Do You Know What You Have? There are a lot of people these days reading books on their tablets or other e-reader devices, however some of us still like to own physical books. Even if you’re reading on your electronic device now, you may still have a personal library of books that you want to hold on to – maybe of your favorite authors, hobbies, various studies or DIY books. So for the books you want to keep at home or in your office, are they organized in a manner that you can tell what you have? Maybe a better question is, can you find the book you need quickly? If not, below are a few tips to getting books organized. If the way you are currently organizing your books works for you, you should be fine. However, if you don’t have any idea what books you have and you’re constantly looking for a particular book, consider indexing your books into Paper Tiger. This will give you an inventory of what you have, and will allow you to search for keywords such as a word in the title of the book, author, type of book, genre, and any other information you want to input about each book. Also you will be able to print out a report of the books you’ve inventoried in Paper Tiger. If your books are scattered, gather them together in one place so you can see what you have. Sort by type of book or author. You may have several books by the same author and want to keep them together. Do you have a prized book collection that you’d like to display in a prominent location? Decide where this should be? Do you want all of your books in your bookshelves, or do you want certain types of books where you will use them? For instance, do you want your gardening books near a patio for quick reference? Do you want a basket or location on the table next to your bed or favorite chair for the book you are currently reading or the books you plan to read next? You may want to give some books away or resell them if you know you will not refer to them again. Go ahead and purge those now, and make a plan as to what you will do with them as soon as possible. Otherwise, they will become clutter pushed from the garage to the basement, moving from one place to another without a real home. Remember clutter is the result of postponed decisions. Go ahead….make a plan: what will you do with these books you’re getting rid of and when will you do it? Now that you know what you’re keeping and in what order and where you want them, index them into Paper Tiger. This will take less time than you think, and you’ll be glad you did! 1. In your Paper Tiger database, add a new Location entitled “Books”, with capacity of 100 (you can increase this later if you need to by editing the Location capacity. If you want to keep certain books together, and you know you will be purchasing additional books of the same author and you’ll want to put the new books together with those already indexed, add a new Location for just those books. For instance, you like the author Max Lucado, add a Location entitled “Lucado”, and then you’ll index all books for this author into this Location. Don’t forget to add the correlating number to the new book spine. 2. Then print labels for each Location ready to affix onto each book spine as you index it. 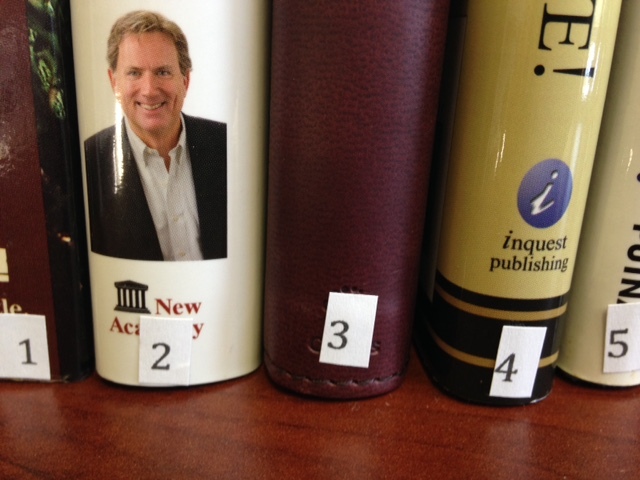 Alternately, you can use a label maker or marker to put the correlating number onto the book spine. -If you have Professional or Pro edition of Paper Tiger, you will be able to apply a Category to the item. If so, add new category for the type of book/genre: drama, comedy, romance, historical, self-help, DIY, etc. As information, the Basic edition does not have the Category function. If you have Basic, then you can add the type of book/genre to the keywords section, then when you search for a specific type, Paper Tiger will search results for all of the books that you’ve indexed with that category, which is basically the same thing that would happen if you were to select the Category drop down box in Professional or Pro. 4. As you index each book, affix the corresponding label to the spine and place the book on the shelf where it will reside. As you’ll see in this picture below, the spine of each book is numbered so when you search Paper Tiger, you’ll know what the book number is, and be able to quickly go directly to the corresponding book on the shelf. You’ll also know where the book should be returned. The bottom line is that if you can put a number onto an item, you can index it into Paper Tiger… then whether the physical items you’re getting organized are paper files, boxes, bins, books, etc., type in a keyword for an item the same way you do with an online search engine, you will find it. 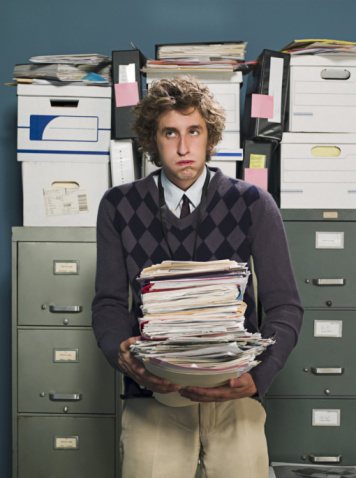 Let Paper Tiger Filing System Software work for you and get organized today! Are you already organized or do you need to get organized before the busyness of the next couple of months go in full swing? Yes, it’s that time of year again, already! Time to get the house spruced up for the fall and winter holidays that you and your family recognize and celebrate. Fall and/or Halloween, Thanksgiving, Hanukkah, Christmas, New Years! That’s a lot of decorating and celebration within just a couple of months. With the holiday season upon us, decorations are becoming an everyday sight. Are your decorations organized in 1 or 2 boxes or stuffed wherever you could find room last year? Is the Christmas tree in a box never to be found again in the attic? Do you dread wasting hours untangling lights? It can be a chore when trying to locate where you have certain decorations stored when it seems some are in the garage, some are in the attic and some have made their way into the basement. Or you may have them all tangled together just to keep them all in one place. The problem is, this big tangled mess can cause damage to the seasonal décor you have stored. This may even make you so frustrated that you opt to forgo adding any holiday cheer to your home or lawn altogether. According to IBISWorld, Americans spent 13.34 billion dollars on holiday decorations and costumes alone in 2010. Can you envision how much that number has grown since then? Year after year, we purchase more and more decorations in addition to the ones we already have. The countless ornaments and lights could take up a lot of space in your garage or attic and become quite pricey. But, what if there was a way to put the fun back in decorating AND save yourself from becoming another shopping statistic? What if you knew exactly which box your favorite set of Christmas candles were? The important thing really is to use a filing system software like Paper Tiger to keep track of what you own, what you are storing and where it is being stored so that the items can be easily and quickly retrieved when you need them. You might have thought Paper Tiger was just for paper! But actually, you can index virtually any physical object into your Paper Tiger database. Indexing your items into Paper Tiger filing system will ensure that you know exactly where these things are, before you end up buying duplicates of something because you can’t find the original. Documenting or indexing your belongings also helps other people who may need to retrieve things for you. With a quick search in the software database, anyone will be able to find an item and also know where it should be placed when it needs to go back to the storage location. Getting Organized Now For Your Holiday Decorations! Now you can get organized with Paper Tiger Filing System Software and know where everything is with a simple search in the database. As the seasons and holidays change, so can your home, with less stress. You can still win 1st prize in the Homeowner Association’s best-decorated home contest without buying new decorations each year, because you can find what you already have without a lot of stressful searching. Paper Tiger allows you to give each set of holiday decorations a home of its own. Imagine if you found all the decorations you’ve purchased for each holiday, each year in one place. Imagine no more! Not only will all the decorations be right where you left them next holiday season neatly packed away, but also the combination of all the decorations will allow you to be really innovative when decorating next year. Maybe take the stockings you’ve accumulated over the years and form a mixed pattern above the fireplace. No fireplace? Use decorative ribbon as a bed for glass ornaments in a fruit bowl as a centerpiece in the dining room for a jovial meal. Before you run rampant with all the new decorating ideas, let’s organize the decorations you currently have. 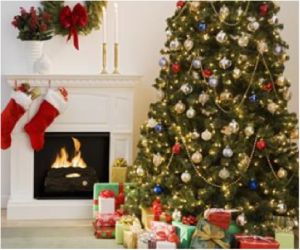 -First check every nook and cranny of your house for decorations. Take your flashlight in the attic with you. Gather the decorations so that you can begin to sort them. -Then, sort the decorations by their various holidays. Santa and his reindeer, the Thanksgiving harvest table kit and pastel plastic Easter eggs should all go in separate piles. If you don’t already have storage boxes or containers, grab a couple from your local retailer to organize your items. Depending on the amount of items you have, you might need at least 1 storage container for each holiday. It will take a little effort to get things in order to begin with, but once you invest this initial work into the project, your holiday decorating will be easy as can be for each occasion. With Paper Tiger Filing System Software, the decorations are stored and the disarray that once consumed and cluttered your space is replaced with the joys of the holiday season. Paper Tiger will help preserve the life of your decorations, because they will always be stored away neatly instead of mixed in with everything else in the top of a closet. Money will be saved because you’ll know what you have, and the efforts of searching for decorations will be swapped with a few strokes on a keyboard. Never worry about holiday decorations scattered throughout the house again, but know and embrace what you have and build upon it with creative new twists because you took the time to get organized. If getting organized before the holidays is too much to think about now, make plans to get organized as you’re putting the decorations away! Do you have trouble managing a home office? Add the kids and their activities, along with your busy schedule, and the managing with efficiency gets more difficult. Things get left undone, and the piles of paperwork, mail, magazines, kids’ artwork, not to mention all the stuff totally unrelated that finds a place on your desk you haven’t taken time to put away. Whether you work from home or your home office is a place where you pay the bills, read the mail and file paperwork, you should be able to actually work from your desk. Your desk should not be a landing pad for everything that can be put away later. Stop procrastinating and make the decisions necessary to keep your desk looking good and a place where you can actually work. Of course, tips such as the ones listed below could relate to any area of your home that collects clutter. You know what you have to do, but without scheduling time and a concentrated effort, the job will not get done. So take a look at what piles up on your desk. Is it just mail and magazines that are piling up? Or are there CDs, books, kids’ artwork, tools that need to be put away, office supplies, and other trinkets? Have a family meeting to discuss what needs to go and what needs to stay. Whatever is on your desk that should not be there, create a ‘home’ for each type of item that would be best kept elsewhere so they don’t land back on your desk. You simply have to take the time to decide what you need to do with the problem area, what is your vision for the area, create a plan of action, clean and organize, and then maintain it. Sort through the piles and gather similar items together so you can determine the right kind of container ‘home’ for organizing these items. Where should these items be kept and what containers would work best for accessibility? Everyone should agree on the container ‘homes’ so it will be convenient and efficient to maintain your office organization. Would a CD binder help to keep CDs or DVDs together? You can place the CD/DVD in a binder such as the one pictured below. As you can see, the item number was written with permanent marker on the DVD and on the DVD binder slot. So the DVD numbered 45, would match what was indexed in Paper Tiger’s item number 45 for the DVD Location (DVD 45). Everyone will know where it should be returned as well. Then index the name, author, and other pertinent information into the item’s keyword section in your Paper Tiger database. Then when you want to pull a specific DVD, a quick search in the database will reveal where it is. Do you have USB drives that you’re trying to keep up with? If you just have a few, maybe a small box or divider in your desk drawer would work. 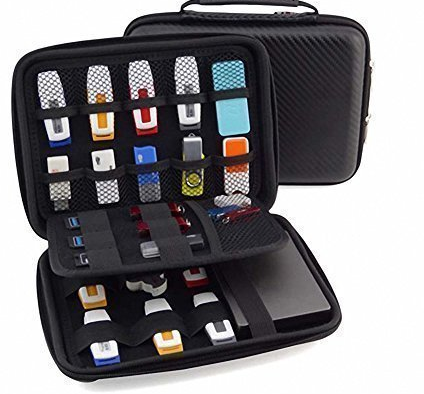 However if you have more than 5 USB drives and growing, you should start organizing in a USB drive organizer like the one below. Number your USB drives. Then document the file contents in your Paper Tiger database. Additionally, you could take a screen shot of the file list on your USB, then print, write the number of the correlating USB drive on the printed screen shot and put the print in a hanging file folder. Do you let magazines pile up? Think about what would work better for you. 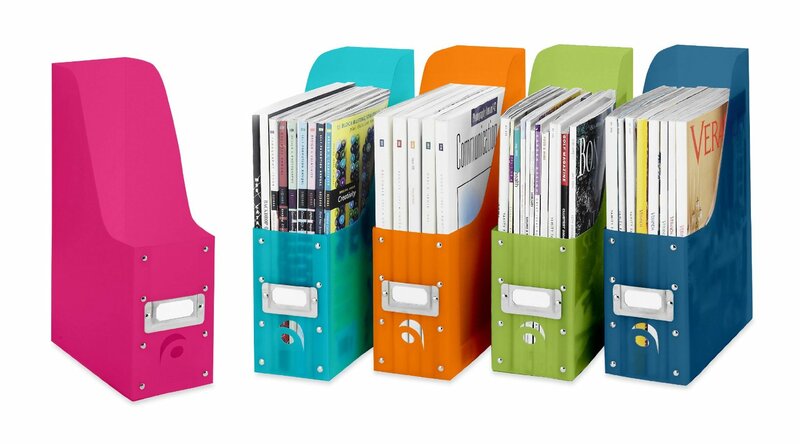 Maybe a magazine organizer like these pictured below would help keep your magazines together, but only keep what you really want to keep. Or maybe after you’ve gone through the magazine, cut out only the articles you want to refer to again, then trash or recycle the rest of the magazine. You’ll need a place to file the articles you keep. Depending on the volume, you could have one hanging file folder to hold the articles. Note, the magazine organizers can also double as a home for directories or manuals. These can also be used for some office supplies such as manilla folders, notebooks, assorted envelopes. 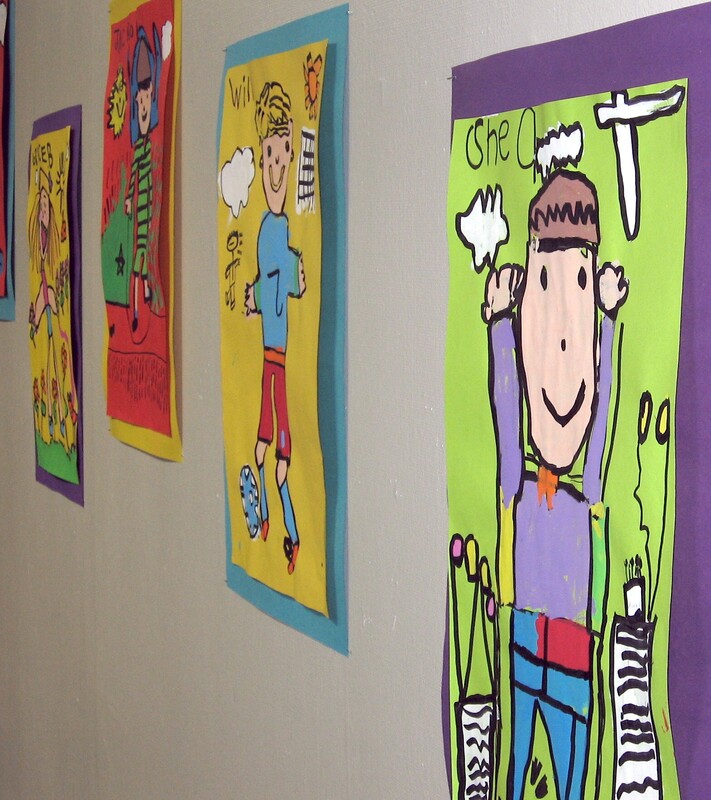 For kids’ artwork, allow your child(ren) to choose the artwork that should be kept. Consider framing the best, and put the rest of the keepers in a portfolio, one for each child. 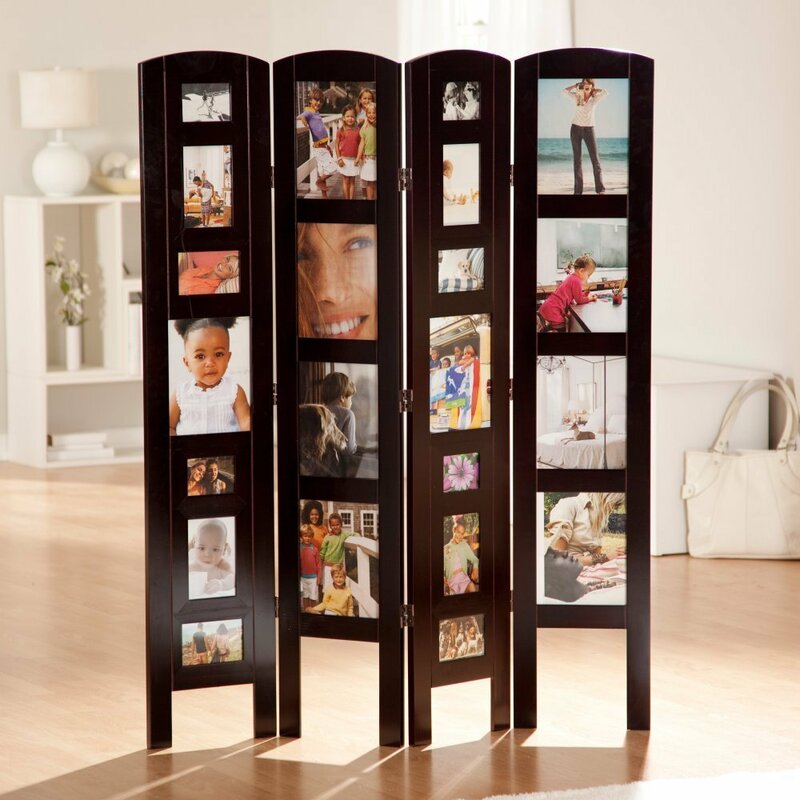 Framing can be as simple as the image at top of this page or in a photo frame room divider such as in the image below. Remember, you don’t have to keep every paper or artwork your child produces. You can always take a picture of the art that you won’t keep so you will have a digital image of the ones you’ll throw away. Getting the kids involved in choosing, creating and updating their schoolwork/art portfolio will empower them to manage their own paperwork, as well as which artwork gets switched out as they grow older. Now, what about the stacks of paper files? Sort through the stacks and throw away the junk. If it’s not worth filing, don’t keep it! Keep in mind to adher to legal and tax retention guidelines. (Have you created a records retention policy for your home and business files? If not, click here to learn more about Retention Guidelines: How Long Should You Keep Records?) Shred sensitive information. Using Paper Tiger Filing System software will help you keep track of the paper files you decide to keep, but do not require action. Click here to see examples and managing of Reference Files. For things that need action, either do it now or place a note on it that outlines what action needs to be taken and by what deadline. Click here to see how to manage Action Files. Get the kids involved if there is a lot of shredding to do, especially in your initial file clean out. Discuss with your family how to handle the mail when it comes in. Plan to take 5-10 minutes every day to go through the mail. Quickly scan through the sales papers and ads if you want to, then throw them away. Place your bills in the place you’ve designated for your bill reminder. Do you have a folder for bills or are you using a tickler file system? If you don’t have time to read the mail that needs to be read, place in a ‘to read’ file. If it is time sensitive, consider a tickler file system referenced above in the Action Files article. How will you all work together to maintain the space? Once you have a ‘home’ for everything, and everything in its place, everyone needs to continue to do what you’ve agreed to so the area doesn’t get cluttered again. A simple reminder, ‘Whoa, that doesn’t go there! It has a home!’, will keep everyone on task, and you’ll be creating good habits that benefit everyone. Then have everyone take a few minutes a day or once a week, to work together to clear any clutter, rethink something that isn’t working as well as you thought and reorganize for more efficiency. It will be so much easier, take less time, and you’ll have more time to spend together doing the fun stuff with less stress! Do you feel like you are the only person that has clutter and don’t have any idea what to do about it? Well, you’re not alone! The average American receives 49,060 pieces of mail in their lifetime; 1/3 of it is junk mail. 80% of papers and information that we file or keep, we never use or look at again. In the top 10 list of management wasters for the past 20 years is managing paper. According to management engineers, misfiled documents cost between $61-122 to be retrieved. The cost is calculated by the value of the person looking for the file, the person interrupted to find the file, the space the file occupies, and the cost to recreate the file if it cannot be retrieved. Americans waste 9 million hours per day searching for misplaced items. The average U.S. executive wastes six weeks per year searching for missing information in messy desks and files. For an employee earning $60,000, that lost time costs the company a staggering $6,290. Office workers waste an average of 40% of their workday. Not because they aren’t smart, but because they were never taught organizing skills to cope with the increasing workloads and demands. Using the correct organizational tools can improve time management by 38%. Unnecessary expenditures related to disorganization (last minute shopping at premium prices, buying duplicates of misplaced items, rush charges, late fees, finance charges, etc.) can cost as much as 15% to 20% of your annual budget. 25% of people with two-car garages don’t have room to park cars inside due to clutter and 32% only have room for one vehicle. With statistics like these, obviously you are not alone. Also obvious is the negative impact that clutter has in our lives. Knowing that productivity, budget, time and health are all affected, it is still overwhelming to think about how to declutter your world. So how do we fight the war against clutter? Vision for end result: You may only have one room that collects clutter. You know, the proverbial ‘junk room’. Or clutter may be only on your desk or in every room. Whatever your individual situation, you need a vision as to what you want. Some experts suggest taking photos of every room in your home to see a different perspective. It may be there are items cluttering a space that you are overlooking everyday. While you’re thinking about it, also think about why you want it. Sometimes it is not enough to see and feel the pain point in your life in order to do something about it, but when you can have a vision for how it could be better and why or how it would make you feel if it were better, then you will have a better chance of getting started with the determination to get it done. Prioritize: Don’t feel like you have to clear all the clutter in one day! Remember, the clutter in your life and the habits that got it that way didn’t happen overnight. Make a list of each room or area in the order in which you want to get organized. Decide what area is stressing you the most, and start there. Then schedule time on your calendar, allotting the amount of time you want to spend for each room. Some areas, like the garage, might take more than a couple of hours in one day, so schedule a couple of hours in two different days. It might even be helpful to create a plan of action for an area that is too overwhelming – making a list of what items you want to organize first, then second, etc., in an area so that it won’t seem quite so overwhelming. Goal/project management & schedule: Set your goal and schedule your time. 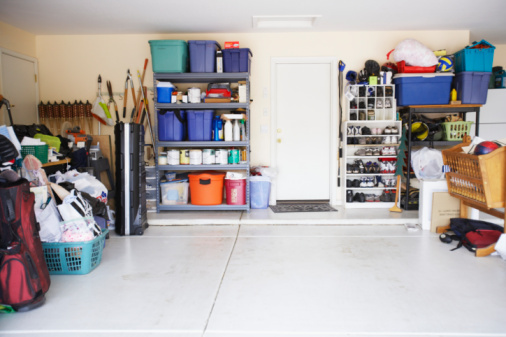 How many times have you thought, ‘I really need to clean out the garage, but it will take so long, and I have to do this and that, before I tackle that huge job’, and it just never gets done? It may help you to break down a big project into individual steps. For example, schedule an hour to sort through and organize the sports equipment on one day, then on another day, take an hour to sort through and organize the tools. You probably set goals for your business life all the time. It’s the same concept with things you need to do to get organized. Creating new habits and a new perspective need reminders to stay on course. So really, actually put the different project times on your calendar just like any other event in your life. Willpower for action: Once you have your projects scheduled, make a commitment to yourself that you will stick to it until your vision comes to fruition. You may need help along the way. Don’t be afraid to ask for help. You may need to reschedule a project, because life happens, but make sure to reschedule it on your calendar. Take one room at a time. Envision how you want the end result. Make a list of individual steps to break down the project(s) so you won’t feel so overwhelmed. Decide how much time each step will take and put it on your calendar so you’ll have a reminder and you can stay on schedule. Determine what needs sorted, organized, boxed, given away, trashed, and filed. Remember, sometimes simply organizing what you have is not the answer. Sometimes you should decide to get rid of stuff. Refer back to the stats above! Decide what you would like to keep in the home or office, what you would like to box up and keep either in the basement, attic, a rented storage unit or some other type of storage space. Implement Paper Tiger. For each container, whether it be a box or hanging file folders in your desk drawers or filing cabinets, index or catalog each item by typing in item name and keywords into your Paper Tiger filing system database, including where the item will be stored. Any changes or moves you make to your physical items can also be adjusted or ‘transferred’ in your filing system database, and you’ll always be able to track your items. After each room in your home is organized, go through the same steps for your office envisioning your desired end result. Make a list of steps, how long it should take, and schedule the time on your calendar. You might start with the top of your desk. Find a ‘home’ for everything – the right place on your desk for each item that will help you work more efficiently. Take one stack of paper files at a time, and then one drawer at a time, indexing the items in your hanging file folders into Paper Tiger’s database as you go. If you get discouraged, go back to your vision. Remember why clearing the clutter will help you to feel less stressed, will save you time, will help you to be more productive….whatever your reason, remember your vision for the end result. Re-prioritize if necessary, and set a new goal, but get recharged and make it happen. Maintain! Take 5 minutes to go through the mail, and trash the junk, file what needs to be filed, and put items that need your action and bills to pay in your action or tickler file system. Take 15-30 minutes every day to walk through your home or office and put things away so clutter doesn’t build again. There are all those paper files, mail to go through, magazines, books, training binders, DVDs and video games to straighten up. When you remember that book you wanted to read while on vacation, it takes more time than it’s worth to find it! There are seasonal clothes to move to and from storage, if you can remember which bin in the basement that you’ve put them. You also have that treasured collection, some to showcase and some to store for safekeeping. And of course, the garage! The good news is that you no longer have to procrastinate. By implementing Paper Tiger Online filing system software, you can now clear the clutter and feel confident to put things in their own place. Paper Tiger enables you to index physical items, and makes it easy to keep track of things. It will be so worth the time invested to clear clutter and get organized, because you won’t be wasting time searching for needed items. You’ll be able to find them again when you need them…in a matter of seconds with a quick search in the database. If you had a folder for your car repairs and needed to refer to it, could you be certain you could find it when you needed it? Would you remember if you titled it car, auto, Honda or repairs? Did you actually get it filed or is it in that huge stack ‘to be filed’? By implementing Paper Tiger filing system, you can type in all of those keywords and be able to find anything with a quick search in the database. The traditional alphabetical system has obviously worked, as long as you could recall the name you filed it under previously, that is – so maybe not as efficient as it could be. Using Paper Tiger Online filing system software takes all the confusion out of the equation, even if more than one person is using the system. Paper Tiger can be used for paper files, but also for many other physical items. Anything that you can put a number onto, you can index with your filing system software. This is especially important for items that may be kept in more than one location. So, for example, if you are going to keep some collectible items on display and want to store some in your basement and others at a rented storage unit, this helps you recall which items ended up where. Each box would have an item number in your Paper Tiger database, and the contents of the box should be typed into the keywords section. All those items you keep cluttered in your home because you’re afraid if you put them away, you won’t remember where you put them, can now be stored somewhere else. When you need to retrieve an item, search your Paper Tiger database, and you’ll know where it is and what box number in seconds. Go ahead, get started with the steps outlined above to clear the clutter. Before you know it, you’ll feel more organized and accomplished, and less stressed. You can live organized with peace of mind because you have a place for everything, you know where everything is, as well as where it goes when you need to put it back in its place. Clearing clutter will free up so much space and you can have your home and office back! We all know that clutter can get in the way of success, peace of mind and happiness. Whether you can get it done yourself, with family members, or with an expert, getting organized and getting rid of clutter, can be accomplished. Have you lost the ability to be creative? Are you tired of losing important records? Is a growing list of demands getting the better of you, or those around you? Are you ready for a change and want to break the cycle? You are not alone in your challenge to keep clutter and overwhelm from draining you of time and energy. 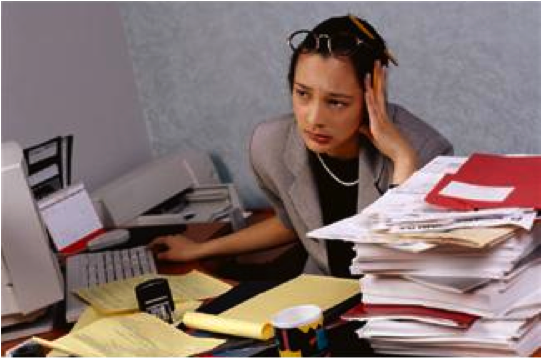 If you are seeking some calm in your life and work, have piles of paper that need to be organized effectively, or even if you have some big projects you want help getting launched, professional organizing and productivity experts can help. You can have an effective work space and home you love. 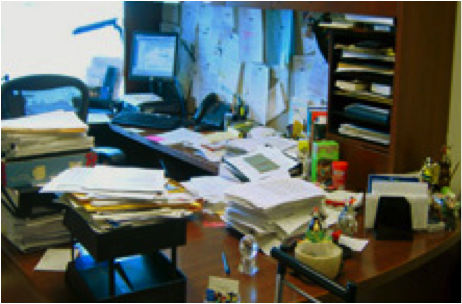 The experts we know often say there is a direct correlation between stress and clutter. Recognizing that clutter is significant in the way you feel about your home and office can be a great start to your feeling less stressed and overwhelmed. Psychology Today has a great article you might find helpful, “Why Mess Causes Stress: 8 Reasons, 8 Remedies”. In WebMD’s article, “Clutter Control: Is Too Much ‘Stuff’ Draining You?”, it states, ‘Professional organizers who are called to cluttered homes and offices say their clients use the same words, over and over, to describe their reaction to the mess: their energy is drained, they can’t find things, and it’s beginning to interfere with crucial parts of life — such as getting to work on time or navigating staircases. ‘They become overwhelmed, nonfunctional and nonproductive…’, says Lynne Gilberg, a professional organizer in West Los Angeles, CA. Clutter happens because you’re not making decisions when you need to. You’re putting off or procrastinating because you don’t want to deal with it. If you really want to have less clutter, make the necessary decisions. Decide to decide what needs focus, what can go, what should be kept. Take one room at a time or one section of a room. What is your vision for the area? What is your goal for this space? Write your vision down for the area you want to focus on first, and make a list of things needed to accomplish that goal. Once you’ve made that determination, you can decide what needs to be cleared from that space, and where the items need to go….either in the trash, donated, recycled, or put away in a better storage area. Finish one area, then move to the next area on your list. Don’t de-clutter alone. Get your family involved. Chances are, it is the family habits that need to be rethought. It’s most likely not just one person that causes all of the clutter. When you’ve cleared the clutter, you’ll need to switch to maintenance mode to ensure the pile up doesn’t happen again. When there is a place for everything and everything in its place, then it will be easier to maintain. Are You Afraid of Putting Things Away? If you have clutter because you think you need a visual reminder…if you put it away, you’ll forget about it or where you put it, then Paper Tiger can help. You can index anything in Paper Tiger that you can put a number onto. See our article Work SMART! Getting Organized Doesn’t Have to be Hard! for helpful steps to sort, make decisions, file papers, and index other things you can organize and put away, so that not only is clutter no longer a problem, but finding things you put away is no longer a problem. You, your family, and your staff, can work less, earn more and be more productive. Get started today with just one area. If you need help, ask one of the productivity experts that can also help you implement Paper Tiger so you can clear clutter, and be able to find things quickly. Work SMART! Getting Organized Doesn’t Have to Be Hard! It can be overwhelming just thinking about what you have to do and the decisions you have to make to get organized. You might be tempted to give up before you start – but don’t! Whether you’re organizing your desk drawers, filing cabinets, a stack of paper files, a closet, attic, or the garage, Paper Tiger Filing System software will help you get organized! You can have a system in place so you can maintain organization, and be able to live and work in an more productive environment. You may be asking yourself, why do I want to add another ‘system’ to my chaos. Will this really help me get organized? Think about it this way. You are already wasting a lot of time searching for things, whether it be a file under a name you don’t remember what you filed it under, or maybe you’re looking for something that you’ve boxed up in the attic, but you don’t know which box? You also may dread the thought of having to make decisions about what to throw away or what to keep. Remember the Pareto Principle, you know the 80/20 rule … we only use 20% of what we have, and the other 80% are back-ups, mistakes, things we have held on to because we haven’t made good decisions about what to do with them. If you don’t try to figure out a system that will help you get organized so you can find what you need when you need it, you may come to realize that you’re only using 20% of what you can find! Sort: Whatever you’re organizing, you will need to sort through the clutter. Put similar or like things together. Think about the similar items you have scattered throughout your home or office, and make a home for those like items to get them together. For example, do you have appliance manuals and warranties scattered, but cannot find the one you need? Depending on the volume of these similar things, designate a drawer, a hanging box file folder, or a box for these. Note that you don’t have to go searching for these items now. This could waste a lot of unnecessary time, however you will at least have a home for these items and will know where they go when you organize and sort through another part of your home or office and come across them at that time. Make good decisions now! You’ll need to ask yourself some questions about your paper files and other stuff. Set yourself up for a maintenance plan that can be continued. Does this need action on my part? Does this need to be given to someone else for action? Delegate! Send it on, with instructions if needed. Do I really need it? Do I need to keep it for tax or legal reasons? What will happen if I throw/give it away, but need it again later? What is the worst thing to happen if I don’t have it? If it’s a paper file, does it exist elsewhere? Is it recent enough to be useful? Or if physical other than paper, have I used this in the last 6 months? If not, ask if there is a more convenient place for this item, or could it be more beneficial to someone else. Do I love it? If you don’t love it, decide to give it away or toss it. If it is something that causes you emotional turmoil when asking these questions, is it something that you could take a picture of for the memory, and then let it go? When using Paper Tiger, you have the decision as to how you want to differentiate your types of files by creating what we call ‘Locations’ in the database. A Location is a group of like items, and could relate to where you will store your physical items or could relate to the types of physical items that you plan to index (paper files, books, CDs, DVDs, storage boxes, etc.) Your Locations can be named anything you want – however you relate to what you are indexing, i.e., Office files, Home files, Action files, Reference files, House, Basement, Garage, etc. Paper Tiger uses Locations to represent these places where you store the items you want to be able to find later. For example, your Reference files Location might contain an index of all files in your 5 file cabinets of 4 drawers each, and Item #1 in Paper Tiger starts with the documents in the first hanging file folder in file cabinet 1, and end with Item #500 in with all documents indexed from the last hanging file folder in file cabinet 5. Or you could differentiate your paper files even further with additional Locations such as Clients, Financial, Administrative, Research, etc. Toss/shred: If you don’t need a piece of paper, then throw it away or shred it! If you don’t need that old bike anymore, give it away to someone you know or maybe a non-profit agency such as http://www.bearingsbikeshop.org/. If you can’t wear or haven’t worn some of your clothes or shoes in a year, then give them away to someone you know or maybe to Goodwill. For other physical items, (such as books, CDs, DVDs, boxes/containers, etc. ), decide if the items need a location in Paper Tiger or if you can index keywords for the items in with other things. See other Location suggestions described on our Not Just For Filing Paper page. Basically, anything that you can put a number onto, can be indexed into Paper Tiger. For example, for CDs or DVDs, you can either place a numbered label that matches the item number in Paper Tiger, on the CD/DVD jacket or you can place the CD/DVD in a binder such as the one pictured below, index the name, author, and other pertinent information into the item’s keywords section in Paper Tiger. As you can see, the item number was written with permanent marker on the DVD and on the DVD binder slot. So the DVD numbered 45, would match what was indexed in Paper Tiger’s item number 45 for the DVD Location (DVD 45). To create your custom Location labels or more Action or Reference labels, Paper Tiger makes it easy. In case you’re wondering, there is no limit to the number of locations you can have! Click here to see even more ways to use Paper Tiger to get organized. Paper Tiger Filing System software combined with a proven methodology, enables users to get organized and manage paper and other physical items more effectively. Work the SMART system and get organized quickly!